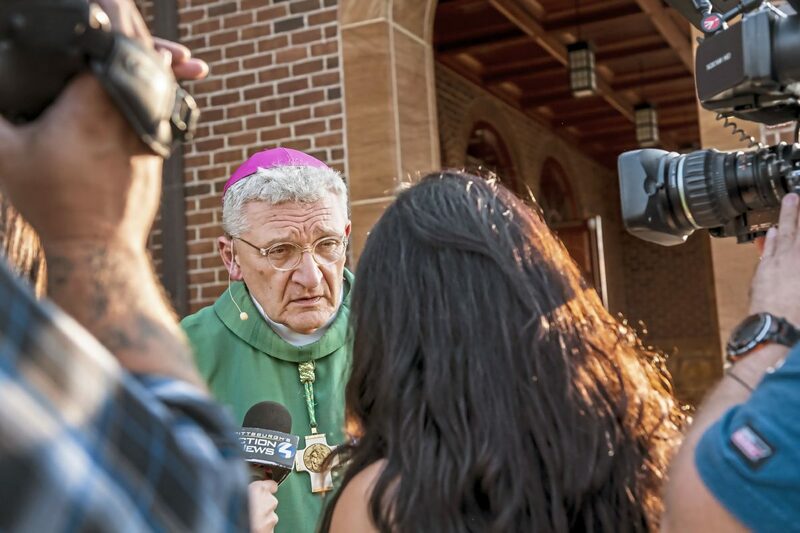 Bishop David Zubik, current Bishop of the Catholic Diocese of Pittsburgh, takes questions from reporters after vocation Mass at Saints John and Paul Parish, Saturday, Aug. 18, 2018, in Franklin Park, Pa. Zubik gave brief remarks about the recent release of the long-anticipated grand jury report documenting seven decades of child sexual abuse by hundreds of Roman Catholic priests in Pennsylvania. Thank God for the grand jury subpoenas. For they extracted — like rotting teeth — clergy-abuse personnel files in unreachable corners of six Pennsylvania Roman Catholic dioceses serving 1.7 million people. Thank God for the courage of the victims. For without them, Attorney General Josh Shapiro and his team would have had no real cause to root out and unveil decades of depravity and systemic abuse by clergy, overseen by complicit superiors. Do not, however, thank the Men of the Cloth. For many of them, despite their broadcast sanctimony, were among the liars, the hustlers, the actors who protected the predators. The grand jury heard from dozens of witnesses and reviewed more than a half-million pages of internal diocesan documents. Since the Boston scandal blew open the dark secrets of Catholic clergy abuse 16 years ago, no one within the church had managed what a 23-member Pennsylvania grand jury and dozens of investigators assembled for the public on Tuesday in Harrisburg. They delivered a nearly 900-page investigative report revealing the horrid ways that children were ravaged for decades by priests, and how church leaders from diocese to diocese worked to conceal the horrors. More than 1,000 young victims — possibly thousands more — allegedly were assaulted by 301 priests in the Dioceses of Allentown, Scranton, Harrisburg, Greensburg, Erie, and Pittsburgh. As Shapiro spent over an hour detailing the grisly allegations at a news conference, I couldn’t take my eyes off the men and women of his investigative team. Many stood silently along side walls as their elected boss exposed a church that for a long time has been seemingly inculcated in the culture of corrupting minors without sanction. Daniel J. Dye, a senior deputy prosecutor who has worked for more than four straight years on clergy abuse investigations for the office, stood behind Shapiro. Dye’s hands remained clasped before him except for a moment when he touched the shoulder of a weeping victim seated on stage near him. Watching from the front row, among dozens of journalists from across the state and the nation, was Mark Rozzi. The state lawmaker ran for office four years ago by saying, on the campaign trail, that he, too, had been abused, by a Catholic priest at age 13 in Reading. Victims on stage with Shapiro nodded somberly toward Rozzi. They all know the man. Two years ago, after former Attorney General Kathleen G. Kane released a horrendous report into abuse in the Altoona-Johnstown Diocese, Rozzi fought, but failed, to change state law so that men and women his age would be allowed to sue the church. Including a 2005 grand jury probe into the Archdiocese of Philadelphia, no diocese in Pennsylvania has now been left unexamined by criminal authorities. His goal in the weeks to come, he said, is to take another shot at passing that bill. The church has pleaded through the years that its priests and bishops were not, until more recently, full cognizant of the psychology and impact on children of pedophilia. This was one of the church talking points after the Boston scandal. They claimed that bishops and their administrative underlings only grew to appreciate that in more recent years. In effect, the argument went, these spiritual men were too naive to know better than to call police if they found out a priest had raped a 9-year-old boy. That’s a laughable claim now. It is nearly impossible to read all eight grand jury probes of Pennsylvania’s dioceses, including the extensive one produced in 2005 into the Archdiocese of Philadelphia, and believe that claim. One case that stood out in Tuesday’s report involves former Erie Bishop Donald Trautman. The grand jury said Trautman concealed from the public that the Erie Diocese had known about multiple allegations of child sexual abuse against the Rev. William Presley. When asked by the media about the priest in 2003, the diocese falsely claimed that it “had no information to provide” on any case involving that priest except for crimes that had occurred 28 years earlier, the grand jury found. “Later that year, Trautman communicated with the Vatican” about information that confirms the “suspicion that there are even more victims of the sexual abuse and exploitation perpetrated by Presley,” the grand jury reported. In a statement through his attorney, Trautman alleged inaccuracies in the grand jury report. Thank God for church records. For they shall guide us all toward truth. Maria Panaritis is the regional columnist for The Philadelphia Inquirer.